Then this is for you! - A simple yet comfortable fix that will improve your daily sitting experience in multiple ways that you didn't even know were possible. This will make you look forward to sitting at your computer desk day to day. Maximum Comfort - Our footrest cushion was designed to provide extreme comfort, our foam platform will give both the perfect balance of support and comfort. Considering that our footrest cushion is very durable, you can choose between shoes or socks, it really doesn't matter... And hey, if you get the footrest cover dirty, you can just WASH it! Health Benefits - At Bovize, we value your health! Thats why our product also focuses on Circulation Improvement. Sitting in a chair all day limits your physical activity and creates problematic pressure points under your legs, even if you use an "ergo" chair. Both of these can lead to bad blood circulation. However, keeping your feet elevated on our quality foot rest can really reduce your chances of getting circulatory conditions. Feel Fidgety? - Flip the Bovize foot cushion over, curved side down, and allow your feet to rock away. Fix For Lower Back Pain - Sitting for a long period of time along with poor leg and foot positioning puts extra strain on your lower back. A good footrest pillow allows you to sit back as much as you want in your chair while avoiding slouching! ► SUPPORTIVE & HEALTHY: Make health and productivity a priority with ease, even while sitting at your computer desk. Enjoy RELIEF from LEG and BACK FATIGUE by improving leg and spine alignment. Our ergo foot rest pad also raises the legs to promote BETTER CIRCULATION. Pro-Tip: Lay the FOOTREST on the curved side to enable ACTIVE SITTING and allow you to keep your feet moving all day long. COMFORT! ► EXTREMELY COMFORTABLE Ever wonder the difference a padded desk foot rest can make at the home or office, or while traveling? It's undoubtedly better than just resting your feet on the floor. Tough enough to use with shoes, the SOFT FABRIC + SOOTHING FOAM design allows you to use any footwear you desire! ► BRILLIANT FEATURES: Our goal is to provide you with a simple and effective under desk ergonomic footrest. The ANTI-SLIP tread underside keeps the footstool in place on most surfaces. The hassle-free cover is QUICK TO REMOVE and EASY TO CLEAN (machine wash - air dry). While other footrest cushion zippers slide on and scratch your floor, our zipper is living on the edge to keep your FLOOR BLEMISH FREE. ► WHY CHOOSE US: Other footstools are too tall, too soft, not durable enough, or even too slanted, The Bovize foot rest pillow features a COMFORTING yet SUPPORTIVE RESILIENT FOAM that leaves ROOM FOR YOUR KNEES under the desk, and WILL NOT WEAR OUT OR DEFORM with using daily. 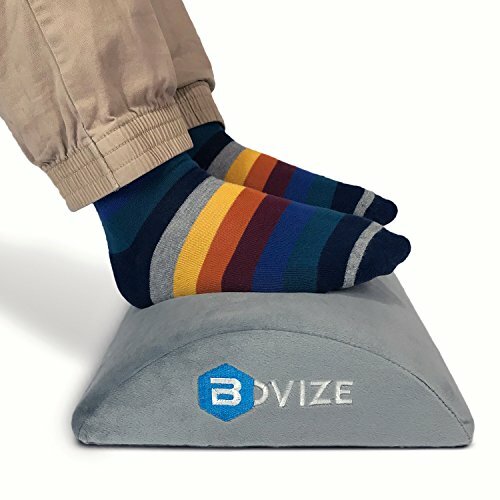 ► SATISFACTION GUARANTEE: All Bovize Products Come With A 100% Lifetime Manufacturer Guarantee, We will REPLACE or REFUND your order if you are not happy with it, We are very confident in our Foot Rest and truly believe that you will enjoy it, If not then you have this warranty, CONTACT US directly! If you have any questions about this product by Bovize, contact us by completing and submitting the form below. If you are looking for a specif part number, please include it with your message.